Black Samsonite Invoke is a hard side, durable and stylish set of two pieces of high-end luggage with a clean and modern design. You can either get the 20”/28” (102946-1041) set or the 20”/24” (102945-1041) set, the former costing thirty dollars more than the latter as of today. This is an imported set that is exclusive to Amazon.com, which means you can only find it there. But it is stocked in the US and the shipping will usually be quick. The bags are made of hundred percent ABS and have rather strong shell thanks to the intense corrugation. And they are built resistant to potential scratches or scuffing with their brushed textures. They have the four very solid and functional spinner wheels that can be rolled upright in all directions at 360 degrees. You can move the bags smoothly and easily, also with the robust and adjustable retractable telescoping contoured handles that lock at different points. Or you can simply lift them by holding the ergonomic solid side and top handles (all three handles have an ergonomic design). 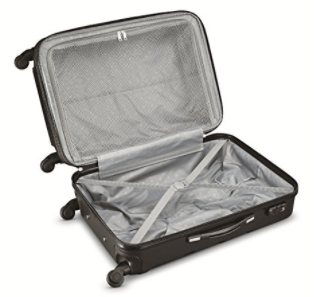 These are the expandable type suitcases with the zipper in the middle opening and giving you an extra 1.5 to 2 inches of space. Pretty much all the features explained here may sound like more or less same as the many other luggage models on the market. But the main difference is the build quality, how sturdy the exterior shell is and the great quality of the components used. 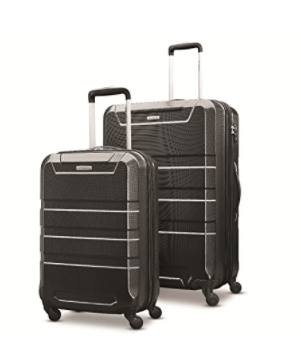 With a great motion range, smooth movement and enhanced control it is also much easier to maneuver the Invoke suitcases with much less effort needed on your side and without any weight on your arms. You will find a full divider and the compression straps on one side and a fully zipped mesh pocket on the other side. They all have the customised recessed TSA combo locks that offer additional security and convenience. Both the Invoke sets include the small 20-inch carry-on bag that weighs 6.8 pounds and with the dimensions of 20 x 14.25 x 9.25 inches without the wheels and the handle. You don’t have to check it in at the airport, can take it with you into the plane and put it in the overhead locker. The middle 24-inch bag weighs 9.1 pounds, measures 24 x 16.5 x 11 inches and you need to check it in, just like the largest 28-inch suitcase that weighs 11.5 pounds and measures 28 x 19.25 x 12.5 inches. It is a hard side set with an innovative flip opening and the convenience of a lighter than normal lid that accommodates 20% of your stuff with the base fitting the rest- 80%. Samsonite is an iconic brand and one of the global leaders in the luggage industry with a great range of durable, functional and innovative suitcases, backpacks, casual bags, laptop bags, electronics carriers and travel accessories.The Invoke is an expensive luggage set but it is a Samsonite after all.